PowerHiked the Tiburon waterfront this morning. It was amazing – ducks, geese, pelicans, gulls and seals everywhere. What an amazing sight! powerhiking in Tierra del Fuego Argentina with snow-capped jagged mountain peaks and the huge Beagle Channel beneath. Ushuaia is the fin del mundo, or end of the earth – the departure point for Antarctica. It’s also a ski village and cruise ship port, full of tourists killing time before they get back on board and head for other parts of the world. Right now Paul Allen’s yacht, Octopus, is in port. Ushuaia is hilly, with its streets running uphill from the harbor. Lots of tourist-friendly shops and restaurants, and legions of tour guides to take you on boat tours in the channel to see the penguins, or for a walk on many of the islands in the channel. 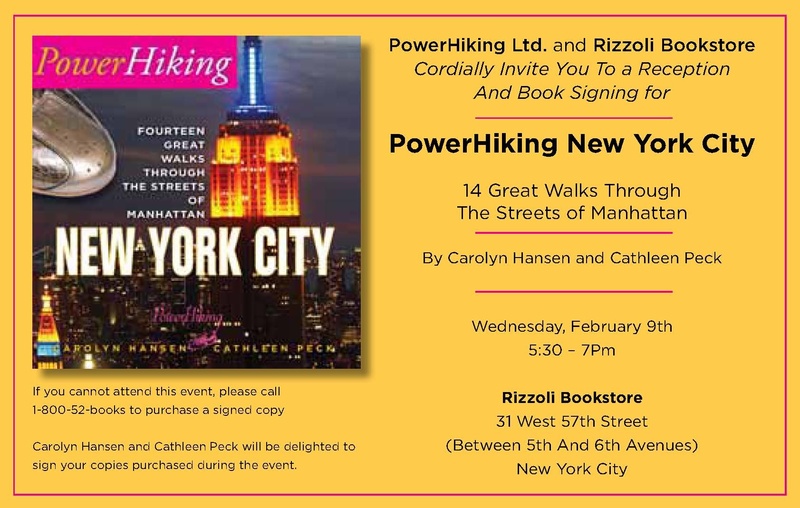 PowerHikers, Join us for our book signing launching our newest book, PowerHiking New York City, at Rizzoli Bookstore, 31 West 57th Street, New York, on Wednesday, February 9th from 5:30 – 7 PM. We look forward to seeing you all there. You are currently browsing the Powerhiking's Blog blog archives for January, 2011.